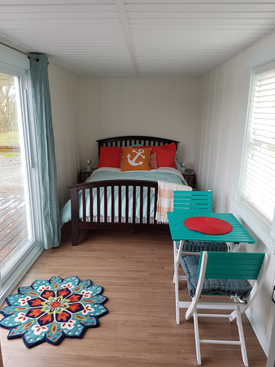 Room amenities: fan, clock radio, flat screen TV, satellite, wifiI, bath robes, hair dryer, toiletries, gas fire pit on the deck. 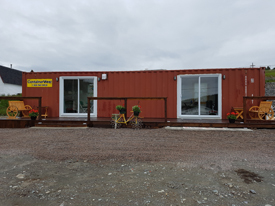 This unique concept was developed from a keen interest in the tiny homes movement as well as a desire to repurpose, reuse and recycle. Guests can also enjoy use of our mud room. Inside this large space you will have room to hang your clothes and packs. With a huge flat screen TV, lots of travel books and films, a hot and cold water tank, microwave, fridge, toaster, coffee pot and a pop corn machine you will have loads to do in this unique space. The shelves are packed with snacks and cereals and the fridge is also packed with loads of brekky options. 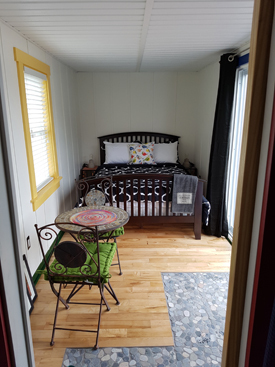 The mud room spoils you with a boot dryer and plenty of floor space to repack your bags and plan your next route. By using this space for all of your bulk baggage and muddy boots you will have a clean and spacious bedroom in the seacan. You will have a key to your room and mudroom so security will not be a worry. We are delighted to offer you this added feature. Drop by our facebook page to keep up to date with photos and events.